Craving a fresh, savory summer meal on the grill? Go with this tasty kabob recipe. Don’t forget to add your favorite veggies to get the nutrients needed for your summer activities! Mix and marinate cubes of chicken, beef, shrimp, or vegetables in sauce. Try to keep chunks of meat and vegetables the same size for even cooking. 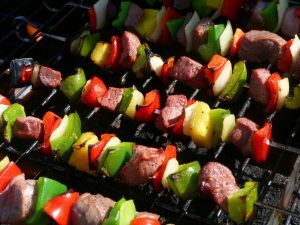 Skewer meat and vegetables with similar cooking times together and grill. If you are using wooden skewers, be sure to soak in water for 10-30 minutes prior to grilling to prevent burning. Serve with a side of brown rice or quinoa for a quick, healthy meal! *Liquid aminos are a 1:1 substitute for soy sauce. Brands such as Braggs are a gluten-free option but still contain soy. Liquid amino brands such as Coconut Secret are similarly substituted but not derived from soy. I (Kim Spoonhower) have been a client at Get 2 the Core Fitness for over three years. In that time Sonia has taught me the value of trying something new. I felt guilty when I began working with a personal trainer- it felt like a luxury afforded to people with much fancier lives than my own, but I quickly learned the benefits of focusing on my own health at least once a week. I was inflexible, exhausted, and stressed. Sonia introduced me to the benefits of strengthening my core, the sweaty exhilaration of cross training in spin class, and the benefits of yoga. With her help, I have biked up mountains in Spain with my husband, won first place in my age group for two 5K races, completed three half marathons, and installed my own dishwasher. I include the dishwasher because through thoughtful listening and gentle encouragement, Sonia inspires me to try new things. I tried a knitting class and recently finished knitting my first sweater. I am taking piano lessons (a life-long dream) and played in public for the first time at the Akron Children’s Hospital Piano-A-Thon last spring. I transitioned away form a career as a physician to spend time with my children who are growing up too fast, and I look forward to career changes that come next. I think I am not alone in appreciating how one hour a week of training with Sonia can inspire radical change in the rest of your life outside the gym. Sonia helps strengthen your core, and with that strength comes the confidence to conquer the world, one small goal at a time. I look forward to speaking with you about how I can help you with your fitness needs.